A London council has launched a new scheme that focuses on re-homing stray or abandoned dogs. Should you take in an older dog or a puppy? It is the kind of story you very rarely hear but Jean Muslun from the Ramsgate area is bouncing with joy after being reunited with her pet dog Libby. Dodger, an 18-month-old Staffordshire Bull Terrier, has had his vision restored after a lifetime of suffering with blindness and deafness. The young dog was born with cataracts and minimal hearing, meaning that he found it difficult to see or hear anything. To make matters worse, Dodger’s previous owner beat him and was caught doing so in an online video. Following the video’s distribution, his owner was banned from owning any canine for 15 years and subjected to a prison sentence. In a follow up story to one published on Boxing Day, a caring family from Staffordshire has done a good deed by saving a dog’s life, when they found an abandoned bull terrier on New Year’s Day. Neighbours in the area were concerned about the dog’s welfare as she was seen wandering around Trentham with no place to go. Shortly after, she was rescued by a nearby resident who kindheartedly took the dog to a local veterinary surgery. A Staffordshire Bull Terrier was left on a wet and cold winter night after being attached to a post outside a dog sanctuary. The dog has now been renamed Bobby after a policeman who rescued him at 3am from his dire circumstances just outside of the Thornberry Animal Sanctuary, in North Anston, South Yorkshire. A Staffordshire Bull Terrier is being cared for by Dogs Trust Evesham after being attached to a park bench and abandoned overnight. Administration manager Nick McCoy found the female bull terrier on the morning of Saturday November 19th. The Staff at Wickhamford re-homing centre have named the female bull terrier Pudding and hope to have her re-homed before Christmas. Pudding is the latest of an increasing number of bull breed dogs that have been handed over to the centre during this year. This is due to many people opting for status dogs before realising they are not able to take care of them properly. Can you give a home to eight dogs? Tougher controls on ownership of dogs are being sought by campaigners in Kent, following increasing numbers of abandoned ‘status dogs’ in the area. BBC Radio Kent has reported that, according to figures that it has obtained, more than a third of all dogs taken by council wardens in the Medway region were Staffordshire bull terriers; out if 882 dogs brought in, 350 were of that breed. We’ve all seen The Great Escape (and if not, why not?) where British POWs escape from a Nazi prison camp during World War II. 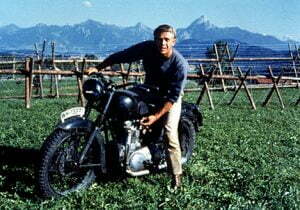 The sight of Steve McQueen on that motorbike eluding the Germans is enough to send shivers up the spine of any viewer on a bank holiday weekend. However, an Australian man recently re-enacted the Great Escape when he busted his dog out of doggie prison, and fled with the Staffordshire Bull Terrier cross, going on the run.